It’s hard to believe that the summer season is over and the cooler temperatures are on their way. We are looking forward to having all of our residents return safely. SunBird hosted its first annual Patriot (9/11) Day parade and service. The parade started on Championship Drive at the bocce ball court area and ended at the clubhouse. The parade included Mayor Jay Tibshraeny, City of Chandler Police and Fire Departments, Maricopa County Sheriff Department, Arizona Highway Patrol, Emergency Ambulance, the Basha High School Marching Band and ROTC color guard and also a bagpiper. This was an awesome event! We want to express our appreciation and honor all of our many first responders. Thank you to all the people who organized, participated in and attended this wonderful event. May we never forget. The clubhouse room addition and balcony extension project is nearing completion. The number of various contractors using their expertise on the project and all the detail that is involved has been very interesting to watch. The balcony extension looks fabulous, adding additional outside space to enjoy the great views of the area. When complete, a grand opening will be planned with a ribbon cutting ceremony, food and fun. Delivery of some new fitness room exercise equipment is scheduled to arrive this month. The fitness room equipment will be rearranged for better use of spacing and to meet new ADA and safety requirements. New paint colors will be used for an updated look, and additional televisions will be installed for increased viewing. A certified exercise fitness instructor will host some group-training classes to demonstrate proper use of the new equipment. Clubhouse new elevator modernization plans have had a slight set-back due to the permitting requirement process by the engineer review staff. Once all the permits have been received and work scheduled, notice will be posted in advance of work to be done. The elevator will have to be shut down for approximately two weeks. The elevator contractor will be working daily double shifts to complete this work as soon as possible. The common area landscape irrigation line-replacement project is progressing well and nearing completion of the first phase. All new irrigation lines, valves and control clocks have been upgraded and replaced from the clubhouse area south to the cart path area between Westchester and Colonial Drives. Next year this project will continue from this stopping point, moving south to replace all of the common area landscape cart-path irrigation parts. Annual road maintenance work will begin early in October. Units 3a and 4 are scheduled to have some crack sealing and have the complete asphalt surface seal coated. These areas will be closed for 24 hours for the work and curing of the new coating. Several large cracks on Kerby Farms Road and Championship Drive will be removed and replaced with new asphalt. This work schedule will be posted and delivered to the homes directly affected. Clubhouse ballroom hard-wood flooring annual maintenance project of stripping the flooring, treating sealing and re-waxing is nearing completion. Normally this project would be done later in the summer, however due to the number of projects and activities, this was the only window of opportunity to squeeze this work into. It has been a very productive summer with maintenance, improvement projects and future planning. 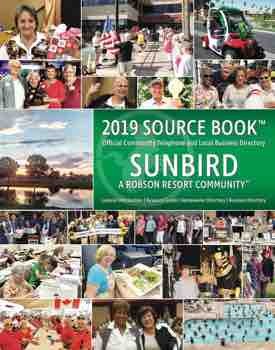 We appreciate our full-time residents and all the inconveniences of these projects and them supporting all of the fun at SunBird. The high season of SunBird residents is approaching and we are looking forward to a fun-filled season at SunBird! When returning back to SunBird, please stop be the clubhouse to see all the improvements and come by the office for a welcome home greeting!